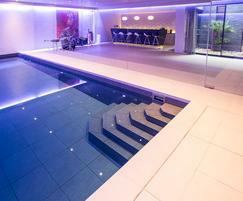 8mx4m x 1.35m deep Subterranean Pool and Party Area. 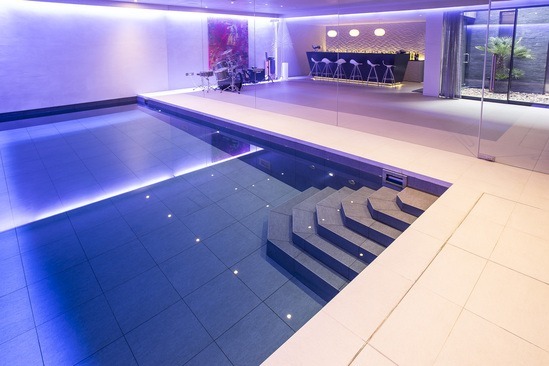 This 8m x 4m x 1.35m deep underground swimming pool was designed and built to enable two energetic teenage boys to indulge their passion to swim full lengths every day, whilst also creating an ample, vibrant floor space for family parties and entertaining guests. A small external patio allows an infusion of natural light to stream into the pool hall, coalescing with the lighting system installed in the pool to create a spectacular effect. 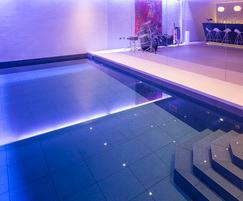 Lighting in the pool is produced by warm white LEDS by Wibre and is complemented by an LED multi-coloured lighting system installed in the ceiling which is linked to the stereo system. This allows laser imagery that pulsates with the beat of the music to be projected onto the wall, creating a fantastic ambience for parties. Renowned for building super luxury pools in London’s most desirable locations, London Swimming Pool Company (LSPC) has returned to this upmarket Wimbledon location. 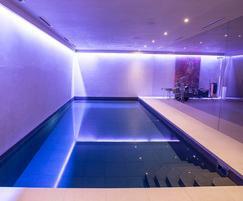 LSPC designed and built this luxury pool as an integral part of a multi-million pound new build by Quartet Architecture. The main contractor, Oak Build London, undertook the complex ground works and construction which included the pool shell with the assistance from LSPC. The pool’s reinforced waterproof concrete shell forms part of the basement. LSPC completed all stages of the project including waterproofing the pool shell and installation of the energy efficient plant room, including the filters and air handling system, as well as the pool lighting, 600 x 600mm elegant grey porcelain tiles and a high specification Ocea pool cover. The pool cover is housed in a hidden pit and floats out across the pool via ‘letter box’ slot. The air handling system, which controls the temperature in the pool hall, is linked to the pool cover so that the heating sets back (lowering of the temperature in the pool hall when the pool is not in use) when the cover is closed, thus conserving energy. The pool uses ultraviolet as a primary sanitiser along with a low level of chlorine in the water. This particular client prefers to maintain the pool, so LSPC provided extensive training for them when the pool was commissioned.